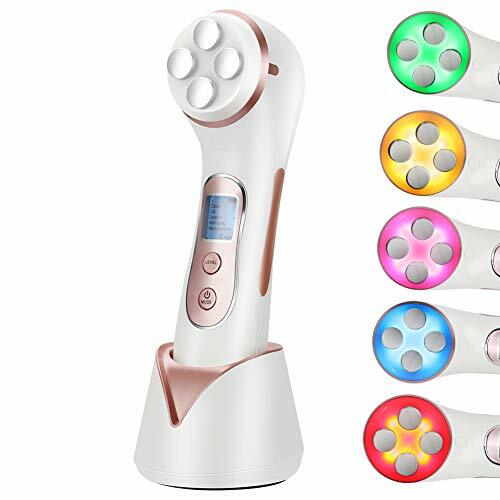 ▶The multifunctionalbeauty device is using the 4 beauty technologies: RF(Radio Frequency),EMS(MicroCurrent),Acoustic Vibration, LED light therapy and set 5 beauty modes: clean, lift,lead in, anti-aging, remove acne. Youcan enjoy the profession skin care. Deep cleansing.Clean up harmful substances in the skin, metal ions,reduce pigmentation, improve skin tone,accelerate blood circulation and skin metabolism. Tighten skin. Restore skin flexibility,pulling wrinkles,adjust the muscles and stimulate the lymphatic system,reshape the face curve. Improve absorption. Enhance the absorption of beauty fluid and make the skin more clear and whiter. It can promote collagen regeneration, make the skin more elastic, suitable for relaxation or wrinkleskin use. Promote blood circulation,anti-inflammatory,sterilization,effectively remove the skin acne,shrink pores.